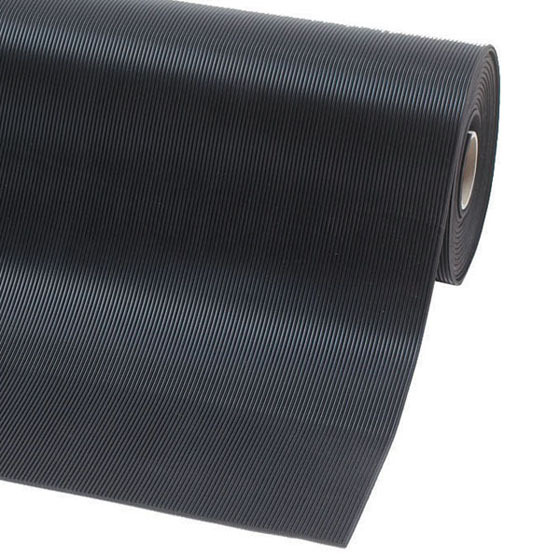 Our V-Groove Corrugated Vinyl Runner is a black multi purpose floor mat that vensures safety and traction while protecting your floors from oils and harsh chemicals. This matting is made from 100% recycled materials and can be custom cut in lengths up to 105'. Low profile makes this mat easy for foot and cart traffic. The V-Groove Corrugated Vinyl Runner™ features a rib-tooth design to improve traction. The industrial runner mat also creates a barrier to cold flooring substrates, and has a silencing effect over noisy tile. V-Groove Corrugated matting can also be used as a liner for maintenance and tool carts. Made with 100% recycled materials.